Decorate a glass vase with a decoupaged rose motif paper napkin then complete this project with an antique crackle finish. Wash the vase thoroughly. With a clean cloth, wipe the outside of the vase with rubbing alcohol or white vinegar to remove any remaining oil deposits that are left behind on the glass from your fingers. Paint the outside of the vase with white paint and allow it to dry. Several coats of paint may be required. I applied three coats of paint to mine. Be sure to allow each coat of paint to dry thoroughly before applying the next. Once you have finished painting, if required, follow the paint manufacturer’s instructions for heat setting the paint. Heat setting the paint at this point will prevent damage to the paint finish with the next step. Now that the paint is heat set and there is no risk of it rubbing off when wet, apply glue to the entire outside surface of your vase. Separate the layers of your napkins, as shown in photo, at right. Most napkins are two or three ply (two or three layers) but you will only need the top layer with the pattern printed on it. First apply a cut out from your napkin (I cut out the rose section of my napkin), by placing the cut out on the wet glue and with your finger or a paint brush, add a little more glue to cover the entire cut out top. 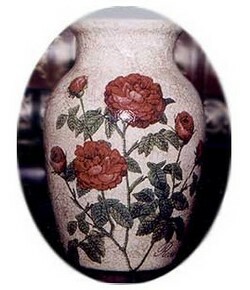 I applied a rose pattern to the front and back of this vase. Now with clear (white) sections from your napkin, tear out pieces and glue them to any exposed paint areas of the vase. You will end up with the entire outside of the vase covered with torn pieces of the paper napkin. If your napkin is not white, paint the vase with paint that is as close as possible to the napkin colour. Don’t try to smooth out the napkins sections; it is almost impossible and the wrinkles add a nice affect to the finished vase. Once you have the entire vase covered with napkin pieces, allow the glue to dry. Apply a crackle medium of choice, following the manufacturer’s instructions for application. Allow the medium to dry completely. Apply at least three coats (six to seven is recommended) of Polyurethane (following the manufacturer’s instructions). This will give you the needed protection against any water spills when using your vase. Although the vase can’t be submerged in water, it can be wiped gently if you apply several coats of polyurethane for protection. These decoupaged vases with crackle paint finish are really are pretty and if you want your vase for decorative purposes only, you can use clay instead of glass. Another idea for clay or plaster vases is to use a water-filled glass inside the container for displaying fresh flowers.